You all know that I am a Diet Coke girl through and through. 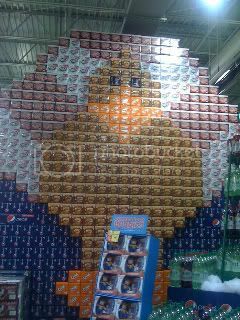 But these Pepsi-brand displays at the grocery store near my house do make me smile. 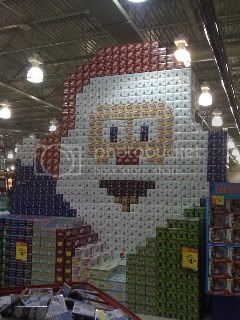 The guys at the bank told me the store manager designs the display, then the Pepsi guys come and build it out of 12-pack cases. I thought I'd snapped a picture of other ones, but I can't find them. I think there was a jack-o-lantern and maybe an Easter bunny. Hope you enjoy these as much as I do. That Santa is awesome! I saw at Thanksgiving in our store a Turkey & I was so excited. I see these on others blogs & had never seen a display in person ... I think I was a little too giddy! :) haha! I saw a Colts logo made from Queso and Ranch dip glass jars at Wal-mart! I think these are pretty awesome! Very, very clever and so cute!